Before you begin with the theme installation, make sure the latest version of WordPress is already installed and you have access to the admin account login details. 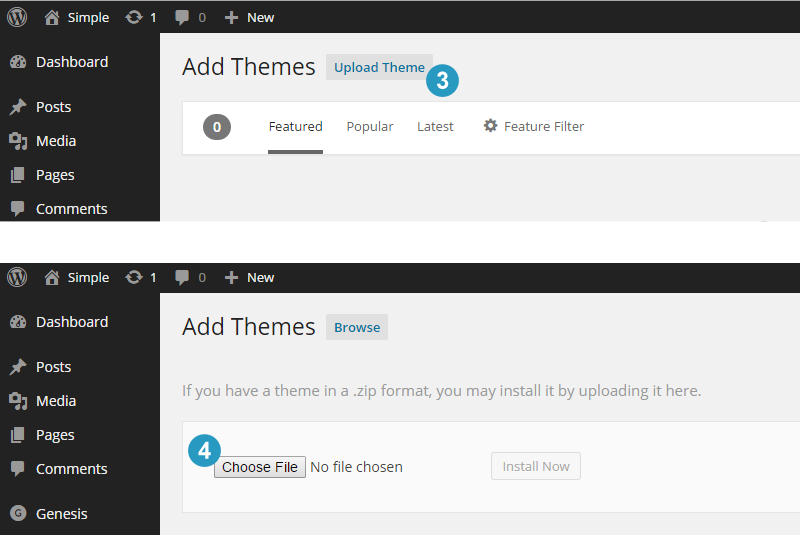 There are two ways to install the Genesis Framework theme and the Genesis Child theme: manual file transfer via FTP and the automatic ‘Upload Theme’ option in the WordPress Dashboard. Below are instructions for both of these options. Note: This is more easy and hence the ‘recommended’ option for theme installation. 1. Log in to your WordPress dashboard and go to Appearance > Themes option. 2. Click the Add New button at the top. 3. Located at the right side of the ‘Add Themes option, click the Upload Theme button. 4. Click Choose File button and then find or browse to the theme zip file on your computer. Select the theme zip file and then click the Install button. 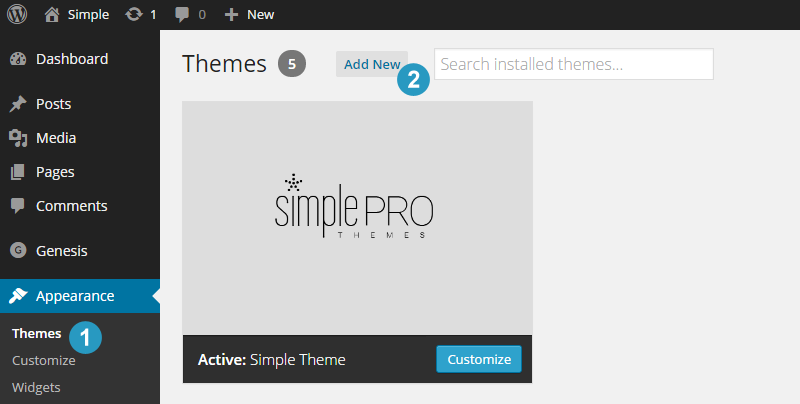 Must Read: You should first install the Genesis Framework theme, if not already installed. Using above steps, select the Genesis Framework theme zip file and then install it. After the install, do not activate the Genesis Framework theme. Repeat above steps to install the child theme zip file. After both the theme files are installed, activate the child theme (and not the Genesis Framework theme). Note: You can download the Genesis Framework theme zip file from your my.studiopress.com account. 1. Download the theme zip files (Genesis Framework theme and then child theme) on your computer. Unzip or extract zip file contents into respective folders. 2. Using a ftp client, log in to your server. You can either use the web ftp option located in the hosting control panel or use any free ftp software program. 3. Navigate to wp-content/themes directory (folder) location. Transfer the Genesis Framework theme folder and the child theme folder to this folder location. Then activate the child theme from WordPress Dashboard by going to the Appearance > Themes section.